Who are “the least of these”? Not who the “social justice warriors” claim they are. Just when you thought Steven Furtick couldn’t get more aberrant, he’s now joining up with the New Apostolic Reformation. Is Freemasonry compatible with Christianity? Well, I’ve recently posted two articles which prove it isn’t, but this is some more good information. This is followed up by a personal testimony about Freemasonry from a pastor, and another from a former Mason. Beware of Aglow International — they are part of the NAR false teaching cult. Beware of Jonathan Cahn — he’s at it again. The Benedict Option — I keep reading about this book and it sounds much like another mine in the minefield of Christian books. Seventh-day Adventists have a weak God. Does God believe in you? Um, No. Have you read the book, “Seeking Allah — Finding Jesus,”by Nabeel Qureshi? I have, and thought it was squirrelly. So do theses reviewers. Another false teacher I’ve not previously heard of — Tamara Lowe. She’s a member of the Word of Faith cult. Then there is this one, also new to me — Poncho Lowder. Examples of John Hagee’s heresy, which condemns Jews to eternity in hell, are found in this excellent article. Some more good exposure of all that is wrong with Andy Stanley. Marriage Doctrine Alone Disqualifies Pro-Gay Theology. Provocations against thy divine majesty have filed my whole life. My offenses have been countless and aggravated. invited me to thy table. 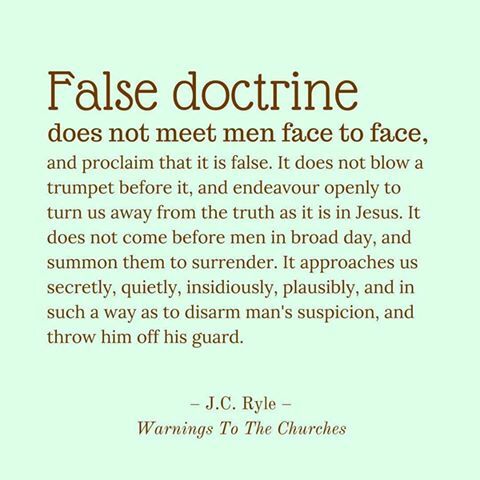 acquiesce in thy gospel appointments. pray that his grace may reign in my life. nor suffer him to be wounded by others. find resources for all needs of the divine life. live as well as hear religion. Many teachings about where we go when dead can be totally unbiblical, including the ideas of “soul sleep” and annihilation, as promoted by cults such as the Seventh-day Adventists and Jehovah’s Witnesses, as well as by many individual false teachers. Along with these teachings is usually the claim that there is no hell (as the place of eternal torment and separation from God). If the scripture tells us the abode of the soul after death, that it is still conscious and aware, then the idea of the soul sleeping until resurrection is proven wrong, as is the idea that the souls of unbelievers are annihilated. One could actually write a whole book on the topic in order to cover what the Bible says about the grave, the afterlife before and after Christ, etc, but here I can only highlight the most important and concise arguments against the “anti-Hell”, “soul sleep” and “annihilation” teachings. As an opening thought, I want to address one of the main passages used to “prove” soul sleep, Ecclesiastes 9:5: For the living know that they will die, but the dead don’t know anything. There is no longer a reward for them because the memory of them is forgotten. So what is the context, and what does it mean? Ecclesiastes was written by Solomon to teach things he had learned about life in general, and is not a doctrinal treatise. He is explaining things from the perspective of humans on earth. The overall passage which includes this verse is about the futility of life’s striving, and that we all know that we will die. After we die there is nothing more to know about life, and our earthly rewards are finished. The memory of the dead by the living is forgotten. So let’s not twist this into claiming that the soul is asleep at death — the soul isn’t even the context. First we have to understand that the soul is immortal, whether it is the soul of an unbeliever or of a believer, and it survives death in a conscious state. 2 Sam.12:23 David speaks of his dead child and how he will know him after death when he joins him. Matt. 10:28 says, “Don’t fear those who kill the body but are not able to kill the soul; rather fear Him who is able to destroy both soul and body in hell.” This a plain statement that the soul is separate from the body and does not die with it. Luke 16:19-31 is a story where Jesus discusses conversations by people who are dead. Philippians 2:10: "under the earth" are the dead, and they are worshiping Jesus so they MUST be conscious. Rev. 6:9-10 John sees the souls of those slain for their faith in Christ, and they are crying out asking God how long it will be before He judges and avenges their blood. Another point to make is that very often in the New Testament a believer is said to be asleep rather than dead. In context it is plain that it is not talking of literal sleep, rather it is speaking of the hope that a Christian has of the soul and body being reunited at the resurrection. In Acts 7:59 Steven asked the Lord to receive his spirt and his body was said to fall asleep, demonstrating the separation of body and soul. So let’s see what the Scripture actually says about the soul after death, starting with what it says about believers. Luke 23:42-43: The criminal hanging on a cross next to Jesus asks Jesus to remember him when He comes in His kingdom. Jesus told that “Today you will be with me in paradise.” TODAY, the day he dies, his soul will be with Jesus. Acts 7:59: As noted above, Steven’s spirit (soul) went to be with Christ. 2 Cor. 5:8: Paul says that to be out of the body [i.e. dead physically] is to be at home with the Lord. Php.1:23: Paul says his desire is to depart [die] and be with Christ. 1 Thes. 4:14 Jesus will return with those who have “fallen asleep through Jesus [died as believers],” meaning their souls have been with Him since death. Where do the souls of unbelievers go after death? Matt: 10:28: As noted above, they go to hell. Matt. 18:6-9, discusses the contrasts of doing away with what brings temptation rather than being punished with eternal fire of hell. Matthew 25:46 compares eternal punishment with eternal life. If the evil are annihilated, then how can they be eternally punished? 2 Thessalonians 1:8-9, like Matthew, says the unbelievers will be punished with "everlasting punishment," but if the dead are annihilated, how can they be eternally punished? Jude 7: In the same way, Sodom and Gomorrah and the cities around them committed sexual immorality and practiced perversions, just as they did, and serve as an example by undergoing the punishment of eternal fire. Rev. 14:9-11 tells of the eternal torment of those who have rejected God by worshiping the beast. The Bible teaches that there will be varying degrees of punishment on the day of judgement (Matt. 10:15, 11:21-24, 16:27; Lk. 12:47-48; Jn 15:22; Heb. 10:29; Rev. 20:11-15, 22;12, et al). The fact that people will suffer varying degrees of punishment in hell proves annihilation is not possible by Scripture. 2. God's wrath has not been satisfied. If God's wrath has been satisfied, then it would be unjust to terminate the unbeliever's life. If God's wrath has not been satisfied, then it would be unjust to terminate punishment. What is the “Gift of God”? From the very first time I read the Bible I always understood that the “gift of God” was salvation through faith by God’s grace. However, over the years I have encountered the Calvinist (and Lutheran) teaching that faith itself is the “gift of God,” and without that gift we would never seek God. In this interpretation, God predestines who he will save and He gives only them the gift of faith (regeneration) so that they will seek God. Well, as I have pointed out in my post, “I Am Not a Calvinist,” everyone has the ability to seek God—but not all will. Now, some Calvinists think the whole process, faith and salvation, is the gift of God. But I don’t see that as any different than saying faith is the gift. For by grace your are saved through faith; and this faith is not from yourselves, this faith is God’s gift—this faith is not from works, so that no one can boast. For by grace you are saved through faith; and this salvation is not from yourselves, this salvation is God’s gift—this salvation is not from works, so than no one can boast. Think about it—which makes more sense? Especially when throughout the New Testament we are told that salvation isn’t as a result of our works. If faith in Christ itself is God’s gift, then how do I receive this faith? Instead of asking, “What must I do to be saved?”, I must now focus on the question “What must I do to believe?” If faith is God’s gift, then how do I get this gift? Do I pray to God and ask for the gift of faith? Do I sit back and do nothing and hope that I am one of the chosen ones who will be given this gift? How do I get the gift of saving faith? It is all confusing and it takes away from where the focus of the sinner ought to be, which is upon Jesus Christ and Him crucified. Some might argue that “faith is the nearest antecedent: For by grace are ye saved through faith and that not of yourselves.” It is certainly true that “faith is the nearest antecedent, but since there are a great number of cases in the New Testament where the nearest antecedent is not the correct one, we should be very careful before applying this “rule.” There are other far more important considerations. Here is the correct rule that Greek grammar demands to be followed: PRONOUNS AGREE WITH THEIR ANTECEDENT IN GENDER AND NUMBER. THEIR CASE IS DETERMINED BY THEIR USE IN THEIR OWN CLAUSE. This rule argues forcefully against the identification of “faith” as the antecedent does not agree with the pronoun in gender. The pronoun “that” (verse 8) is NEUTER, and the word “faith” (verse 8) is FEMININE. IF Paul wanted his readers to understand the pronoun as referring to “faith,” then there is no reason why he could not have used the feminine form of the pronoun [here the author gives the Greek, but I don’t have that font]. This would have settled it. If Paul had used the feminine pronoun then it would be very clear and obvious that FAITH is the gift of God. Paul did not use the feminine pronoun. Why then did Paul used the neuter pronoun? What is the antecedent? If Paul had wanted to refer to the idea contained in the main verb (the idea of being SAVED), then it would have been perfectly normal and appropriate for him to use the neuter gender. It would have been very natural for Paul to say, “For by grace ARE YE SAVED through faith and this thing that I’m talking about, namely salvation, is not of yourselves, it is the gift of God…” If Paul had wanted the pronoun to refer to the idea contained in the verb, the neuter form would be the one to use. We need to carefully think through Ephesians 2:8-9 in order to correctly identify the antecedent. We must ask, “What is Paul talking about in Ephesians 2:8-9? What is his main point?” It is obvious that Paul is talking about HOW A PERSON IS SAVED. The main idea of the sentence is found in the verb “ARE YE SAVED” [or “YE ARE SAVED”]. How is a person saved? Ephesians 2:8-9 answers this key question. Salvation is by grace. Salvation through faith. Salvation is not of yourselves. Salvation is the GIFT OF GOD. Salvation is not of works. Paul is not giving a dissertation on faith, but he is giving a brief dissertation on salvation. SALVATION is his main subject. Faith is mentioned because you cannot answer the question “HOW IS A PERSON SAVED?” without mentioning faith. A person is saved by believing on the Lord Jesus Christ (Acts 16:31). God’s gracious gift of salvation must be personally received, and it is received by faith in the Lord Jesus Christ. John 4:10 cf 14 God’s gift is eternal life. Acts 2:38; 8:20; 10:45; 11:17 God’s gift is the Holy Spirit. Romans 5:15, 17 cf. 18, 21 God’s gift is justification. 2 Corinthians 9:15 God’s gift is Jesus Christ. No where in the New Testament does the word “gift” ever refer to faith. Nor does Paul ever say faith isn’t a result of works, or that faith itself is a work (as I have been told by a Lutheran pastor and several Calvinists), rather he continually contrasts faith with works. When you contrast two things they certainly cannot equal each other! The question the Philippian jailer asked was this: “What must I do to be saved?” (Acts 16:30). Some would answer in this way: “Nothing! You can’t do anything! You are dead and totally unable to respond to God until you are regenerated. You have no part is salvation. God must do it all. You cannot exercise saving faith.” This answer might harmonize with one’s theological system, but there is only one problem. This is not how Paul and Silas answered the question! Paul and Silas told the jailer that there was something that he could do and was responsible to do: “BELIEVE on the Lord Jesus Christ!” (Acts 16:31 and compare how Peter answered a similar question in Acts 3:37-38). In adult Bible class this past Sunday I learned an interesting observation. Every chapter of 1 Thessalonians ends, either in the last sentence or last paragraph, with a statement about the Rapture. 1: 10: …and to wait for His Son from heaven, whom he raised from the dead—Jesus, who rescues us from the coming wrath. 2:19: For who is our hope, or joy, or crown of boasting in the presence of our Lord Jesus at His coming? 3:13: May He make your hearts blameless in holiness before our God and Father at the coming of our Lord Jesus with all His saints. Amen. 4:17: Then we who are still alive will be caught up together with them in the clouds to meet the Lord in the air; and so we will always be with the Lord. 5:23b: And may your spirit, soul and body be kept sound and blameless for the coming of our Lord Jesus Christ. Proof of a horrible lack of discernment among Christians and Christian leaders. Where does it say that God doesn’t talk to us audibly? (A problem with this article is that she does as many do — she applies Rev. 22:18-19 to the whole Bible but it only applies to the book of Revelation!). 28 Things You Didn’t Know About “Christian” Psychology “Christian psychology” is an oxymoron. See my series, The Psychological Method vs Christianity in November 2011. A “worship” experience at Steven Furtick’s church. If this doesn’t convince you how bad Furtick is, then nothing will; his “church” has all the earmarks of a cult. A relatively new cultic group of which you should be aware is “Abolish Human Abortion.” their whole schtick is to consider anyone not spending their lives protesting at abortion clinics as not being good Christians. I’ve only read about them recently due to their attacks on a well-known church. To give you an idea about their tactics, I direct you to two posts by Fred Butler. With the first one he reviews the tract they pass out. In the second, he responds to an AHA attack on him for reviewing the tract. These people have no idea about the real Christian faith. Oh, and they claim that they really aren’t an organization, but the proof demonstrates otherwise. The truth about the Pharisees: They weren’t concerned with sound doctrine. An interesting incident about false teacher Todd White. The Holman Christian Standard Bible has been my favorite version since it came out, but now since they’ve revised it, and renamed it just “Christian Standard Bible,” I can no longer recommend it. They just had to compromise. 2017 is the year this version died (if you can get old ones, go for it!). Of course, coming from Lifeway, I'm not surprised. If a Freemason Died Today. Again, Think About What You Sing!! I had hoped after my letter to our music leader that he would no longer use Vineyard songs. Alas, it isn’t so. We sang five songs during our worship service and the rest were okay (except I thought one was a bit juvenile when the lyrics had “banners fling” to rhyme with “king” and I wonder how one flings banners), but this one just blew it for me. So won't you reign in me again? Won't you reign in me again? Okay, now let’s look at the lyrics and think about what they are saying. I hate to be the one to bust your bubble, but God reigns in everyone! Not that everyone obeys Him, but God reigns everywhere. I think what the author is wanting is to turn His life over in obedience to God, to allow the Holy Spirit’s work in him. But that isn’t what he is saying. I don’t know what it is about song-writers that they always have to use poor grammar—what is so wrong about using the word “because”?!? What are we teaching our children about language with songs like this? Now, if God means more “than any earthly thing,” shouldn’t the song say something more like, “Help me live my life in obedience to you”? The we go back and repeat the first verse, followed by twice repeating the chorus. What—did the author think it wasn’t heard the first time? Endless repetitions of modern songs, used just for building emotions and dancing around, irritates me a lot. ARGH! the repetition! But I’m curious about that third line here: who is being told to “come and praise the Lord”? Is he saying this to the Holy Spirit, sort of: Holy Spirit come and praise the Lord and won’t you reign in me again”? Or is he saying this to his audience as a break from his imploring the Lord to reign in him? As long as we’ve left meaty hims behind and replaced them with juvenile emotional nonsensical lyrics, the Church will continued to spiral to destruction. The blinding of a person’s will happens when he or she has fully invested themselves into something which turns out to be a terrible mistake. Not willing to accept that they have fully invested themselves in an egregious error blinds them from the reality of it. They simply will the error to be true. We see this all the time in cult interaction. You can prove to a person that he has been deceived, that he is believing and living a lie, and you may even see the distress this information is causing him, yet he sets his face, his will, and simply refuses to “understand” what you are saying. This is the second of the two articles I found in my files, which I wrote many years ago. This took a while to type up off the old sheets! I hope you find it informative. Franklin Roosevelt was a Mason, and he stacked the Supreme Court with Masonic justices in 1941. The Everson case of 1947 was the first use of the phrase “separation of church and state.” All anti-Christian cases since have built on the Everson case, even though the idea of “separation of church and state” is not constitutional. Since 1947 all Supreme Court decisions regarding religion reflect bias favorable to the philosophy of Freemasonry. The Mason-dominated Court was primarily during the period 1941 to 1971 when traditional Judeo-Christian values were removed from public schools and public life in general. Much Masonic political action has been to rid schools of religious influence. Historically, Catholic, Lutheran, Nazarene, and Mennonites all ban members from belonging to Freemasonry. The Methodist, Church of England, Church of Scotland, Presbyterian, Orthodox and Baptist churches all condemn Masonry as anti-Christian. In 1738 Pope Clement XII described Freemasonry as “Satan’s Synagogue.” Since then over 200 documents condemning Masonry have been issued by the Vatican. The following are among many great statesmen who decried Freemasonry as evil and anti-Christian: D.L. Moody, John Wesley, Daniel Webster, Chief Justice Charles Marshall, John Hancock, Horace Greeley, Charles Finney, John Adams, John Quincy Adams, and James Madison. Most of the Ku Klux Klan’s major leaders were Masons. Klan advertisements of the 1920s stated “Masons preferred.” Masonic writings are prejudicial against blacks, Jews, and Catholics, and they consider “Aryans” to be a superior race in intellect and manliness. Historically, Freemasonry has been a revolutionary movement organized to advance Kabbalistic Gnosticism; to undermine and, if possible, to destroy Christianity; to infuse Masonic philosophy into key government structures; and to subvert any government which does not comport with Masonic principles. No matter what good an organization does, if it is against God’s laws then anyone who claims to be Christian must of necessity avoid entanglement with such organization.